The baseball world lost one of its legends today… George Lee “Sparky” Anderson. There was no other like him. When I heard this on the news tonight, it got me reminiscing. I grew up three blocks from the Cincinnati Reds spring training facility here in Tampa, Florida. They played their spring training games at the old Al Lopez Field, right by my house (Raymond James Stadium holds that spot these days). The tickets were a buck or so; or free with a Slurpee at the local 7-11 convenient store. Those were the days, huh? 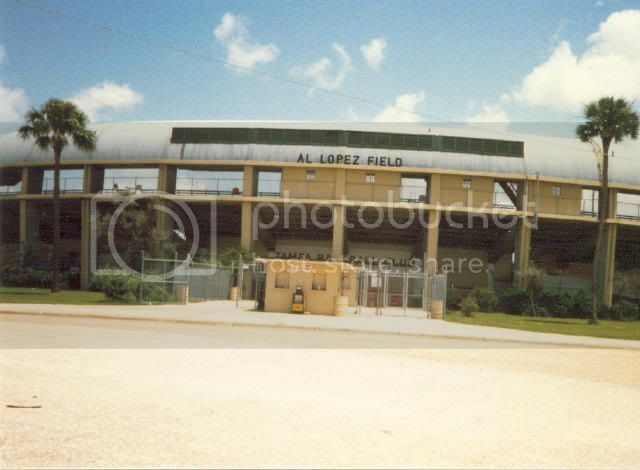 I spent a goodly portion of my childhood at Al Lopez Field and Redsland, as the training facility was called. I went with my older brother to one game in particular that I remember. I met Sparky that day. I also met Pete Rose, Johnny Bench, and Tony Perez. That was some day! I can still picture the sights and sounds of that day in my memory. I doubt it was really that bright an d sunny. The mind always improves memories for the benefit of the person recalling them. Read more about one of the Reds most-love managers, Sparky, at Wikipedia. Oh, and while you’re there, drop a buck or two in the donation can, so Jimmy can keep that excellent Internet resource up and running another year. Posted by V. T. Eric Layton on 4 November 2010 in Reminiscences and tagged Al Lopez Field, baseball, brother, Cincinnati Reds, dad, Johnny Bench, Pete Rose, Sparky Anderson, Tampa, Wikipedia. Hey, Eric! I saw your e-mail and thought I would stop in and read a bit. I hadn’t seen that Sparky Anderson died. Growing up a Detroit Tigers fan, I was also a big Sparky fan. He took the Tigers to the 1984 Series. I think the Tigers were the last team that I hung on to from Michigan. When Sparky retired, I switched my main allegiance to the Brewers. Thanks for posting. I’ll bookmark your blog and look forward to hearing more from you, my friend.